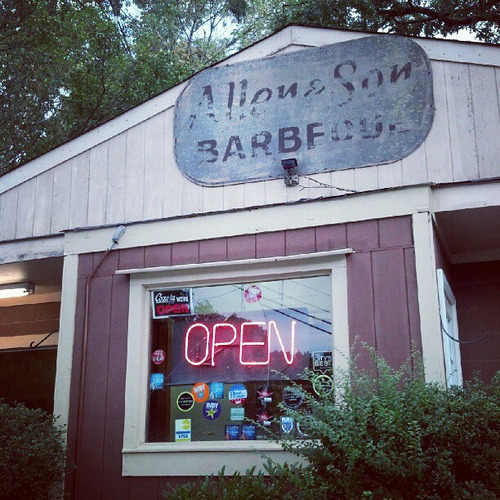 Monk: It had been over a month since we last ate ‘cue together, so I knew just the cure to rekindle our barbecue bromance – stopping at Allen & Son Barbeque in Chapel Hill last weekend on our way to the Hopscotch Music Festival in Raleigh. 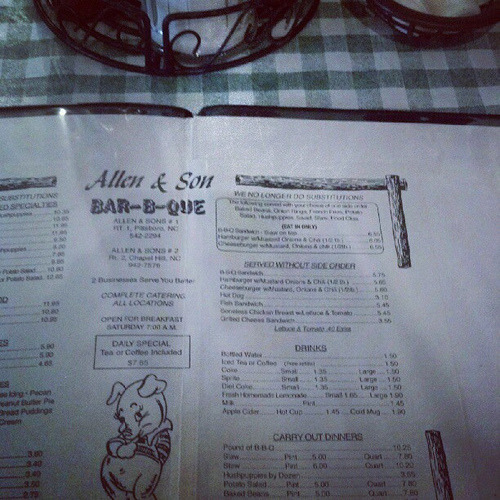 Despite being a legendary NC barbecue joint in a part of the state where I spent a lot of time growing up, Allen & Son Barbeque was not on my radar whatsoever until very recently. Located just a few miles outside of Chapel Hill, they are a bit of a hybrid in that they cook pork shoulders like Lexington but use an eastern sauce. Speedy: When you pull up to Allen & Sons, it’s pretty obvious that you’re pulling into a legit barbecue joint, as the building looks like it’s been there forever (though not in a rundown fashion) and the large smokehouse in the back is visible. 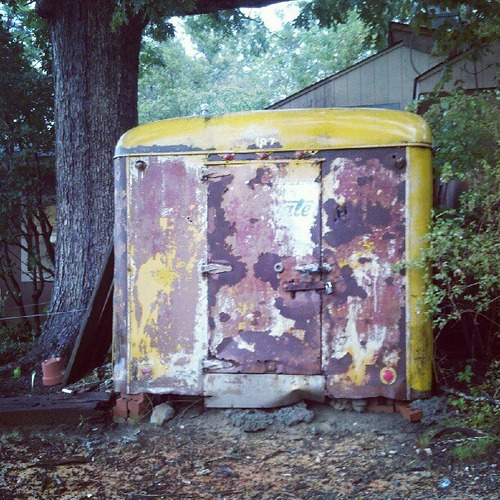 The inside is also what you’d expect. An old school diner type of feel where they tell you to sit where you like when you enter and approach you as soon as you sit to ask if you’d like some sweet tea (but unfortunately not Cheerwine). Monk and I decided that we’re try both the real barbecue items on the menu, so we ordered a plate of the chopped pork and a plate of the ribs. Monk: I’m not hyperbolizing when I say that the chopped pork at Allen & Son’s is probably the second best I’ve ever had, rivaling my personal favorite at Lexington #1. The pork is cooked perfectly with just the right amount of smoke, which can be attributed to the hickory logs which are still split out back with a chainsaw (and is believed to be the only place in NC that splits its own logs). It is then sauced in the smokehouse with an eastern style sauce has some peppery kick and compliments the pork perfectly. I really can’t rave enough about how good the chopped pork here is. Speedy: That’s high praise Monk is spitting over there, but it’s completely true. I can’t say enough how much I loved the pork. I was literally scouring my plate looking for stray bits of pork that I could eat. 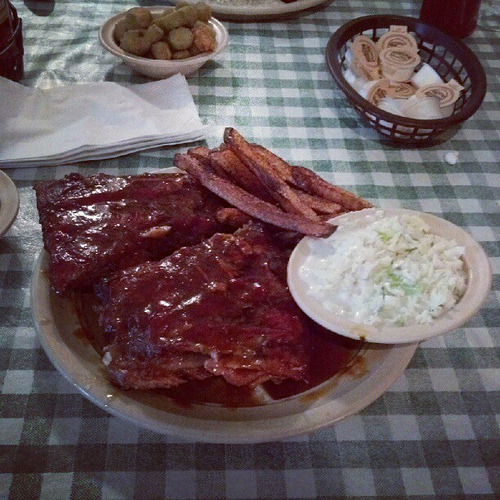 The ribs, on the other hand, are a different story. They were just flat out not good. They weren’t tender, stuck to the bone, and were chewy. The sauce tasted too sweet to me, and I say that as someone who enjoys a good St. Louis rib. It was a red, ketchupy sauce that just didn’t fit with the pork. I’d definitely advise that everyone stay away from the ribs here. 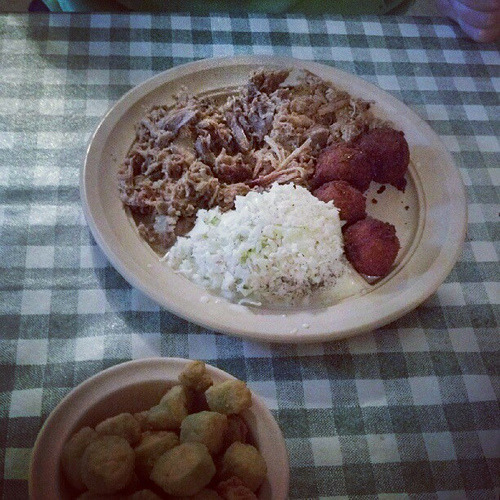 Monk: Being an eastern NC barbecue joint, the slaw is mayo based with some vinegar. It’s not overly sweet and has a nice tartness to it. Needless to say, I liked it more than Speedy. The fries were fine but not spectacular. Speedy: Although I have a well-documented disdain for mayo, this slaw was OK as the mayo didn’t overpower. The hushpuppies were a little disappointing, as was the okra. Both were just plain and lacked any extra flavor that would set it apart from sides you’d get at your average ‘cue chain. Clearly Allen & Sons focuses its energy on it’s proverbial bread and butter – the chopped pork. 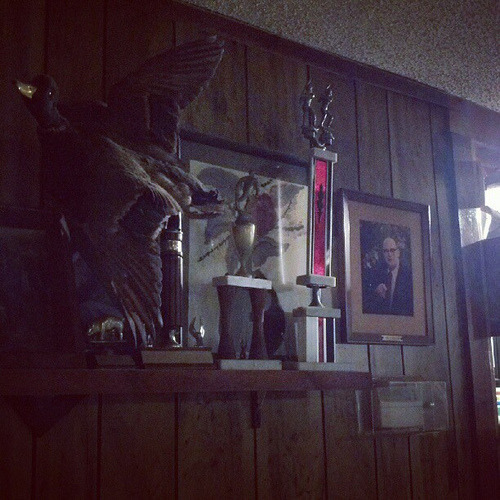 Monk: Judging on pork alone, this is one of the best joints I’ve ever been too. It looks the part of a true barbecue joint inside and out back owner Keith Allen himself chops hickory wood with a chainsaw like a bawse. It may be a little pricey for barbecue (Speedy note: you cannot put a price on that pork – it is incredible), but the service is solid and the food comes out quickly. Unfortunately, what really brings down the overall rating is the ribs. Obviously, if you ever make it to Allen & Son Barbeque, the Barbecue Bros plead with you to go solely with the chopped pork and avoid the ribs at all cost. You’ll be very glad that you did.